Pictured are NUI Galway students and cast members of Of Mice and Men which will take to the stage during NUIG’s Theatre Week. From left, Kate O’Mahoney, Cathal Ryan, Shane McCormack, Ellen McBride, Robbie Walsh and Niamh Ní Fhlatharta. 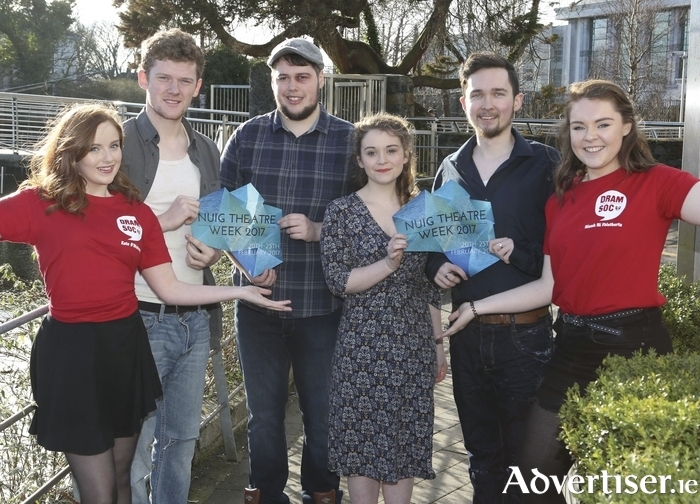 NUI GALWAY'S Theatre Week, showcasing student talent in theatre, literature, and film, returns, and includes Drama Soc performing the stage version of John Steinbeck's Of Mice and Men. Theatre Week runs from Monday February 20 to Saturday 25, with Of Mice and Men, directed by Naoise O'Beirn, running at the NUIG Bank of Ireland Theatre, from February 20 to 22 at 8pm. There will also be the Jerome Hynes One Act Series, hosting five original plays by Dramsoc’s own writers (February 22 to 24 ). Cáca Dána Theatre Company, founded last year by Dramsoc alumni Niamh Ryan, Katie Reid, Marie Hegarty, and Dara O’Donnell, will stage a new play, Eternal Youth, starring and written by Ryan. The play made its debut in North Carolina, and the production saw Ryan win the Sam Seldon Playwriting award. For tehatre week it comes to the Town Hall studio (tickets via Town Hall on 091 - 569777, www.tht.ie ). There will also be a devised theatre performance, dance, and variety show hosted by NUI Galway GIGSoc. Information and tickets are available from The SocsBox, Áras na Mac Leinn, on 091 - 492852 or [email protected].